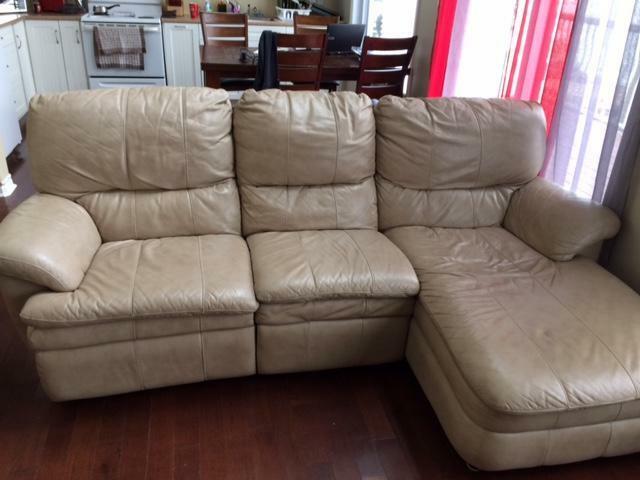 Hi - we have an (almost) 5 year old leather reclining sectional with a lounger for sale. It is in good condition (a few wear marks on it, and one leg is bent from being moved over the vents on the floor...it is still very solid, but slightly bent). The three pieces together are 83 in width, the two seater section is 53 for width and the lounger alone is 30 width and 63 long. Smoke free and pet free home. We are selling it because we bought a bigger sectional with a sofa bed, and do not have the space for both. $575 - can deliver for gas fee (we are in Cobden).